New York University’s master students who are members of HealthRight International had chances to participate in lessons with the aim to guide parents on how to care and foster their children from 0 to 24 months old; and home visiting active members of Learning Clubs to have a realistic view about project’s activities. 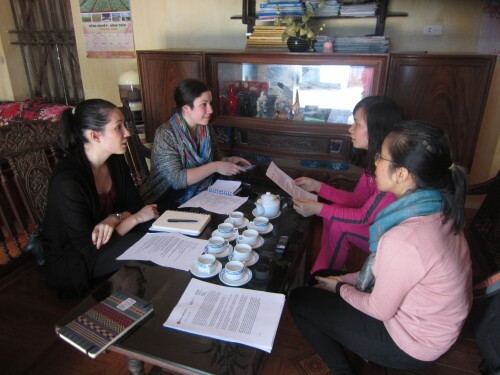 On January 16th- 17th, 2016, Research and Training Centre for Community Development accordance with 4 master students of New York University visited Learning clubs for women’s health and infant development, interviewed women about Project’s activities in Doi Son and Nhan Thinh Commune (Ha Nam Province) to form a resource for writing Protocol for expanding this project in the next period. 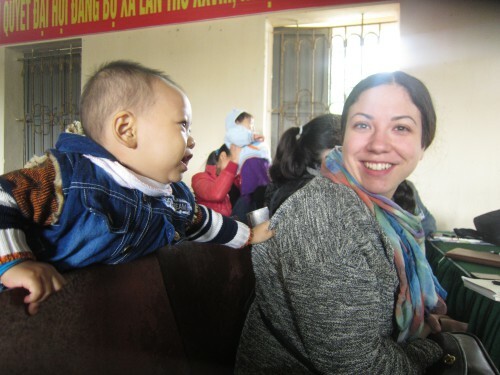 During two-day field trip, master students from New York University participated in lessons delivered weekly on the following topics: “Newborn baby care” and “Playing with toddles to stimulate their movements and self-working skill”. These students were impressed with the eagerness to learn and activeness of Learning club’s participants and the self-confidence when having public speaking as well as skilled guidance on bath, umbilical stump and diaper change for babies of Learning club’s facilitators. 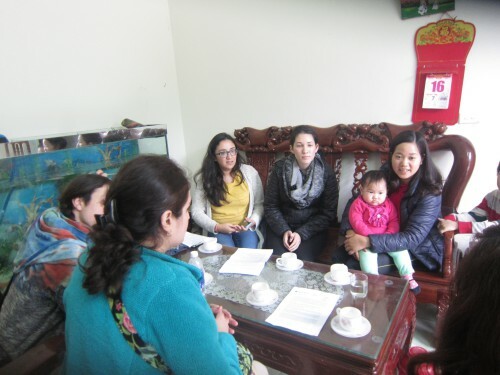 As in this trip, master students of New York University home visited some Club’s active members to investigate and collect realistic evidences about the improvement in child care behaviour after participating in this Learning club. They had chances to observe and evaluate fostering surroundings, child care equipment, practices of the knowledge they acquired after lessons at home. 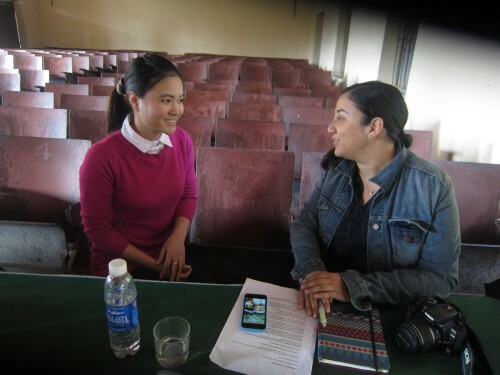 Informants for this time’s interviews varied from farmers, workers, teachers or housewives who spend their whole day on caring for children. They shared their experiences and changes after taking part in this Learning club. Mrs. My Trang Le ( Doi Son Commune, Duy Tien District, Ha Nam Province) is an active member of Learning Club. She participated in almost all lessons therefore she acquired the useful knowledge to apply for caring her children. The topic she concerned most was “three breathing techniques in labour”. Thank for this technique, she delivered normally a four-kilogram baby boy without painfulness and the assistance of cesarean section. Doctors even complimented her on this effort. Until now she has counselled for her four colleagues who are also pregnant about this breathing technique to help them reduce the painfulness when having vaginal birth. One of them who has already given birth to a baby said this technique helped her feel less painful and easy when having vaginal delivery. Mrs. Thi Ngan Tran (Nhan Thinh Commune, Ly Nhan District, Ha Nam Province) compared the traditional techniques she used for her daughters and scientific techniques she is applying for her grandchild now such as “change the colors of rice porridge” (diversify infant’s meals) for infants to be less boring. She also thinks her grandchild develops both in intellect and constitution since he is very intelligent and quick-witted. 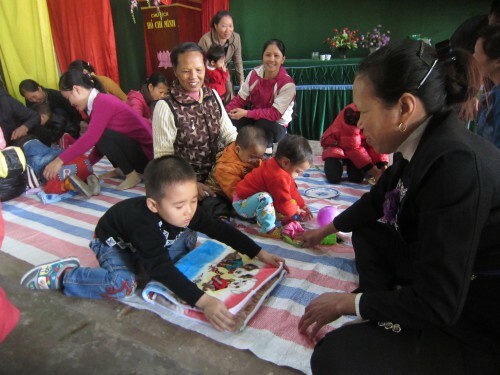 Nowadays, when infant’s parents are too busy to care for them, grandparents are the main caregivers, and Learning clubs are successful to attract the participation of elder generation with backward childcare technique to transfer and apply modern and scientific knowledge.